Today I spent time with an old soul. Like, really old. This all began with an epiphany I had last March. One afternoon I realized that I had spent years telling family and friends of my plans to move abroad and serve the poor, but I wasn’t doing anything at the time to prepare for such a lifestyle of service. In my mind “the widow and the orphan” referred to those living in developing countries, and I would take care of them as soon as I could get my behind to el campo de Nicaragua. Within moments of this awareness I had reset my priorities with a new vow to live with more regard for the widows in my community, particularly the widows on the branches of my own family tree. My paternal grandma has one living sister, Opal (timeless name, right?). She was married to my great Uncle Roy for many years but he died a few summers ago. When I was growing up Aunt Opal and Uncle Roy frequently came to our family gatherings because they did not have any children of their own. I never really developed a close relationship with her until this past spring. If you know me at all, you know that I am a fast-paced person. That’s partly why I love working in the Emergency Department. I love STAT orders and multi-tasking and all things rushed. Hanging out with my 90-something year old aunt has forced me to develop a patient side. Patience is not a quality one can accrue overnight. Or through multiple visits. WOOF. Today I called up Aunt Opal and asked her to accompany me to ArtPrize. The quaint little city of Grand Rapids, Michigan, in which I reside sports hundreds of pieces of artwork every autumn. After two and a half weeks of crowds, cuss words, and colors, the public selects one winner to receive a prize of $250,000. 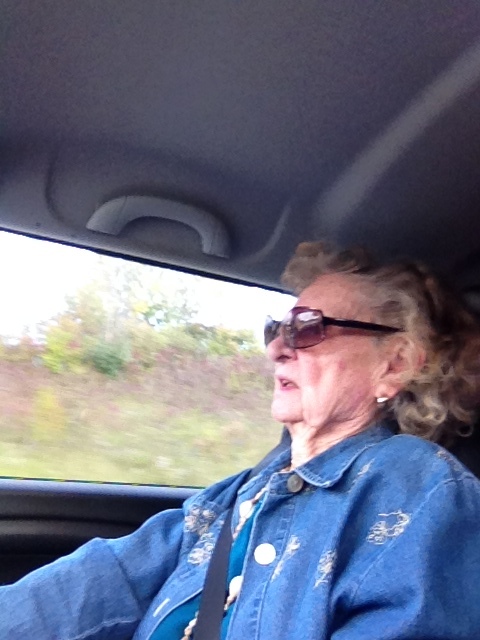 I wanted to drive Aunt Opal around the city so she could see some outdoor art. No problem. I parked at her house at half past 4. She slowly made her way to my car via her walker, even though I wouldn’t consider her actual method of transportation “walking.” Step, plant. Step, plant. Pause. Step, plant. Step, plant. She was so dorky and cute, modeling wide-rimmed 1980s glasses, topped with even larger sunglasses that attach to said 80s glasses via a small contraption. I buckled her in and off we went. I wrapped around the block again and repeated the process. She missed it again. Sigh. I couldn’t even be frustrated–those glasses were just too cute. Besides, the clouds were amazing today. Aunt Opal and I both love clouds, and today the sun broke through the gray sky blanket several times. Thankfully, ooh-ing and aah-ing doesn’t require unhurried diction. We browsed the art scattered around the downtown museums before we changed routes and headed home, our communication improving with every chat. Except that I was trying to drive safely and talk slowly, which required momentous effort on my part. Several cars caught my eye as they passed me. What? Cars don’t pass me. I pass cars. I glanced at the speedometer. Almost 10 mph under the speed limit. I couldn’t believe it! I was starting to slow down in more ways than one. Seven months of intermittent hang outs, flower patterned letters, and phone calls, and Aunt Opal is finally starting to rub off on me. I couldn’t be happier. I need deceleration in my lifestyle and it does not come naturally or easily.